Research from the Kansas Department of Health and Environment noted that in 2010, the state’s registered nursing shortage counts put Kansas 12th in the nation, and by 2020, Kansas is expected to rank 18th. Although that is some improvement, many officials say more needs to be done. The American Federation of State, County and Municipal Employees has pointed out that many states have failed to leverage qualified licensed practical nurses to combat the country’s RN shortage and keep pace with health care demands. In recent years, many US hospitals have decreased their LPN workforce, but in light of growing patient demands, highly skilled LPNs may see more opportunities in the coming years, including in Kansas. To prepare for this career path, learn more about LPN programs in Kansas, state salary and employment, and what Kansas requires to obtain licensure and employment. 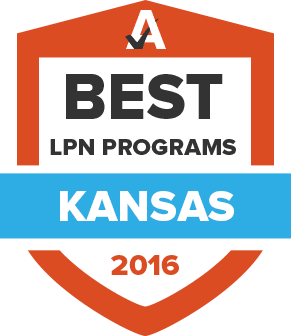 LPN programs in Kansas are offered both full-time and part-time, allowing prospective students to choose a schedule that works best for them. Most are offered through the state’s community colleges or vocational schools. Use the search tool below to find an LPN program that matches your needs and goals. For more detailed information, select your top choices and get a side-by-side comparison to help you narrow down your options even further and get closer to the right practical nursing program. Submit official transcripts to the board. If official transcripts are not submitted, the applicant will not receive authorization to test and the process will be stopped. The KSBN oversees and approves LPN programs in Kansas, including programs at community colleges and nursing schools within the state. Earning a diploma or qualifying degree that allows a student to sit for the NCLEX-PN will require a minimum of one year of full-time study. Many schools also offer flexible programs for working and part-time students. Course and other graduation requirements vary from program to program, but most schools require the successful completion of a specified set of core practical nursing classes as well as a number of general education courses. Most LPN programs also require some amount of hands-on training under the supervision of a licensed nurse. The KSBN may issue an LPN license to an applicant who holds licensure in another state or territory if the applicant meets the other qualifications for becoming a LPN in Kansas. Applicants must provide verification of licensure status from the original state of licensure. An applicant who has not been licensed to practice for five years preceding application is required to successfully complete a refresher course, as defined by the KSBN. Kansas LPN licenses must be renewed biennially and the fee for renewal is $55. The expiration date is the last day of the licensee's birth month. To renew one's license, the licensee must file a renewal application with the KSBN before the expiration date. Except in the case of a first renewal, licensees must additionally provide proof of completion of 30 continuing education units. Failure to renew in time will require the licensee to file a late application and pay an additional late fee. What an individual LPN earns in Kansas depends on a number of factors, including geographic location and specific employer. The tables below offer a look at the top paying areas in Kansas for LPNs. The Health Resources and Services Administration (HSRA) reported that emerging care delivery models are expected to broaden the roles taken on by LPNs, resulting in new growth and demand. Other factors spurring the need for more LPNs include an aging baby boomer population in need of care, a current lack of nursing educators and an older, retiring LPN workforce. The data below provide more information on current and emerging trends for LPNs practicing in Kansas. The Kansas Action Coalition is an organization of nursing leaders, consumer groups, business and others working to transform nursing in Kansas. Sponsored by the Robert Wood Johnson Foundation and the American Association of Retired Persons (AARP). The KANS offers its members a number of networking, education and career services, scholarship opportunities, an annual convention and other events. The KENA offers a variety of membership services including continuing education, events and conferences, advocacy and strategic planning, scholarships and more. The KHCA is a non-profit association representing more than 200 long-term care providers. Its website offers a wealth of information on education, careers, advocacy and current issues concerning long-term and assisted care in Kansas. The KHA is a voluntary non-profit organization providing leadership and a variety of services to its members. The KHA is the lead organization for companies and affiliates that provide services to hospitals in Kansas and the Midwest region. The KONL is a non-profit association of current aspiring nurse leaders, nursing students and others. The KONL offers several continuing education, networking and event opportunities to its over 300 members. The KSNO represents the interests of school nurses throughout the state. An affiliate of the National Association of School Nurses (NASN). The Kansas State Board of Nursing is the official state agency tasked with overseeing the regulation of nursing practice in Kansas. Their website provides comprehensive information on licensing, schools, professional development, continuing education requirements and more. An affiliate of the American Nurses Association. The KSNA's primary purpose is to, "[p]rovide direction and a voice for the profession of nursing and nurses as leaders in health care," through improving health and nursing standards, and promoting professional development. An affiliate of the National Black Nurses Association (NBNA), a non-profit organization representing approximately 150,000 African American nurses throughout the United States, Canada, the Eastern Caribbean and Africa.